ESPN Signs Jim Mora as College Football Studio Analyst; Current Analysts Joey Galloway and Emmanuel Acho Re-Sign Multi-Year Contracts - ESPN Press Room U.S.
ESPN has signed long-time football coach Jim Mora as a college football studio analyst, primarily to appear on ESPN2 studio coverage each Saturday, and additional college football centric programming this season. Mora will appear alongside fellow college football analyst Emmauel Acho, who has signed a new multi-year contract and will transition from Longhorn Network’s Texas GameDay to ESPN’s college football programming. Chris Cotter returns as host on ESPN2 with Mora and Acho this season who step in for Jonathan Vilma and Chip Kelly. Vilma will move to the ABC Studio for Saturday Night Football and Kelly will now serve as head football coach for UCLA. ESPN has also signed studio analyst Joey Galloway to a new multi-year contract, as the seven-year ESPN veteran will continue to appear on ESPN Thursdays, Fridays and Saturdays throughout football season alongside Jesse Palmer and Adnan Virk. The former All-Big Ten wide receiver will also appear on College Football Live in addition to studio programming surrounding ESPN’s biggest college football events. Jim Mora brings more than 30 years of coaching experience with him to ESPN, most recently as head coach for UCLA (2012-17). During his time with the Bruins, he led the team to two school-record tying 10-win seasons, four bowl games and a Pac-12 South Division Championship. Prior to his time in Southern California, Mora coached at the professional level, with stints as head coach for the Seattle Seahawks and Atlanta Falcons. In the NFL, he was named NFC coach of the year in 2004 and in the same year led the Falcons to an NFC South Division Championship. Joey Galloway joined ESPN in 2011 and has worked as both a college football game and studio analyst. Prior to his current run as a studio analyst, a position he has held since 2016, Galloway a game analyst alongside play-by-play commentator Beth Mowins and sideline reporter Paul Carcaterra. 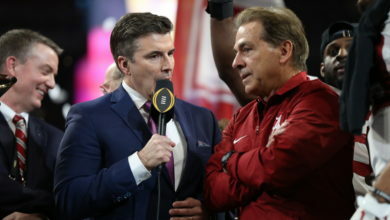 In the last several years, Galloway has been an integral part of ESPN’s college football coverage, lending his expertise to the College Football Playoff: Top 25, the College Football Selection Show and the studio presence of every College Football Playoff, including the New Year’s Six and the National Championship. Galloway’s in-depth knowledge of the game was born from an extensive career at the collegiate and professional levels. As a highly accomplished college player, Galloway played for the Ohio State Buckeyes where he finished his career second in touchdown receptions (19) and fourth in both receptions (108) and receiving yards (1,894). He was drafted in 1995 as the eighth overall pick by the Seattle Seahawks and would go on to play 16 seasons in the NFL for various teams that also included the Washington Redskins, Pittsburgh Steelers, New England Patriots, Tampa Bay Buccaneers, and Dallas Cowboys. Former Longhorn All-American linebacker Emmanuel Acho first joined the ESPN family as a contributor for Longhorn Network’s National Signing Day coverage in the spring of 2016. That fall, he became a full time analyst as part of the network’s Texas GameDay show alongside Heisman Award winner Ricky Williams and National Champion Vince Young. Similar to Mora and Galloway, Acho also had an extensive playing career that makes him a strong voice of the game. During his colligate career in Austin, he posted 278 tackles (159 solo), 41 TFL, eight sacks, seven forced fumbles, three fumble recoveries, two INTs, 13 PBU and 26 pressures. He is a four-year veteran of the NFL. Drafted by the Cleveland Browns, he then spent three seasons as a Philadelphia Eagle.